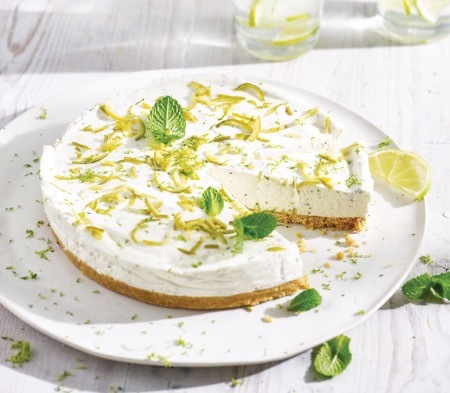 All the flavours of Havana’s favourite cocktail – lime, rum and mint – in a light cheesecake on a buttery biscuit base. We use our tried and tested cheesecake mix made from fresh whipping cream, pasteurised egg whites and soft cheese. We then add the iconic combination of a mojito cocktail: lime, rum and mint. It all sits on a classic cheesecake base made from crushed digestive biscuits and butter. Full Fat Soft Cheese (33%) (contains: Full Fat Cheese Base [Milk], Salt, Modified Tapioca Starch, Stabiliser blend (Xanthan Gum, Locust Bean Gum)), Digestive Biscuit Crumb (21%) (contains: Wheat Flour (Calcium Carbonate, Iron, Thiamin, Nicotinamide), Sugar, Palm Oil, Invert Sugar Syrup, Rapeseed Oil, Raising Agent (Sodium Bicarbonate), Salt), Whipping Cream (12%) [Milk], Caster Sugar, Butter (7%) [Milk], White Rum (6%), Free Range Pasteurised Egg White (contains Thickener: Guar Gum), Water, Lime Juice (3%), Mint Syrup (2%) (contains: Cane Sugar, Water, Mint Natural Flavour), Lime Zest Strips, Beef Gelatine, Mint.